Galileo Galilei  (15 February 1564 – 8 January 1642) was an Italian physicist, astronomer, and instrument maker. Galileo was originally going to be a doctor but became a tutor instead.He was a professor of mathematics and natural science in Padua and Pisa. He is most remembered today for his conflict with the Catholic Church of his day, which led to his trial for heresy by the Inquisition. Some people believe that Galileo was the first person to build a telescope. This is not true, but he was the first person to publish his observations of astronomical objects through a telescope. He discovered that the Milky Way is made of many stars. He discovered that the Moon has hills. He found four moons around Jupiter. Those moons are now called the Galilean moons. He discovered sunspots, which are dark areas of the Sun. He saw that the planet Venus has light and dark phases just like the Moon. This helped people to know that the Sun is at the centre of the Solar System, as Nicolaus Copernicus had said. Galileo worked more at physics than at astronomy. He studied natural forces, and was one of the most important discoverers of the part of physics that is now called kinematics, including the discovery of the kinematic principle of relativity. However, he is often remembered now for things that either didn't happen, or failed. A legend says that he climbed the Leaning Tower of Pisa, and dropped cannonballs of different weights, to see which would strike the ground first. Even though their weights were not the same, they hit the ground at the same time. Galileo found that objects fall to the ground at the same rate, unless things like wind resistance change the rate. This went against the views of Aristotle, an ancient philosopher whose theory was different. Galileo's findings were ignored by most people, and Aristotle's view was still accepted as correct until Isaac Newton proved Galileo was right. This also led to Newton creating his Law of Gravity. Galileo also tried to determine the speed of light. He climbed a hill, and had an assistant climb another hill, both carrying lanterns with closed shutters. He then opened the shutter of his lantern. His assistant opened his own shutter when he saw Galileo's lantern. Galileo then measured the time it took for his assistant's shutter to open. Knowing the time difference, and the distance between the hills, he tried to estimate the speed of light. However, this did not work. Galileo later discussed the question in his most famous work, Dialogue Concerning the Two Chief World Systems, published in 1632 by permission of the Inquisition. His scientific writing was usually in Latin for hundreds of scientists around Europe, but this was one of the books he wrote in Italian so thousands of Italians could read it. The book was in the form of conversations between three men. The man representing the Church's point of view was called 'Simplicio'. Church leaders who liked his earlier books were angry at this one. The Inquisition took action in 1633. He was arrested and put on trial. They found him "vehemently suspect of heresy". They reminded him of the fate of Giordano Bruno, who had been burnt at the stake for heresy on topics such as transubstantiation and the Trinity. Bruno also believed the Earth went round the Sun and stars had planets. The Inquisition forced Galileo to recant (say he was wrong) under the threat of execution, and to withdraw his works from publication. Galileo spent the last ten years of his life under house arrest. Galileo continued to write about physics and other topics, but not astronomy. Siderius nuncius (starry messenger). Venice 1610. Discovery of 'new worlds' with the telescope. Dialogo sopra i due massimi sistemi del mondo, Tolemaico et Copernicano. Florence, 1632. The famous 'dialogue between two world systems'. Discorsi et demonstrazioni mathematiche, intorno a due nuove scienze. (discourses and mathematical demonstrations relating to two new sciences) Leiden 1638. This, on kinematics, a non controversial subject, was written when Galileo was under house arrest, and published in Holland, out of the Inquisition's territory. Galileo published anagrams to show he was first to discover a thing. One is smaismrmilmepoetaleumibunenugttauiras. Galileo explained the puzzle as Altissimum planetam tergeminum observavi (Latin: I have observed the farthest planet to have a triple form), for the rings of Saturn. Johannes Kepler explained the puzzle as Salve, umbistineum geminatum Martia proles (Latin: Hello, Mars has two moons), although the moons of Mars were only discovered in 1877. 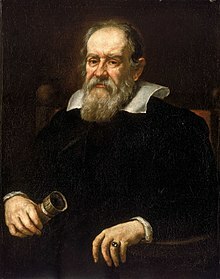 In 1600 Galileo met Marina Gamba. They did not marry but had three children. Galileo was born in Pisa in 1564, the eldest of five siblings. His father was Vincenzo Galilei, who was a scholar and a musician. In 1574, the Galileo family moved to Florence and he started his formal education in the Camaldolese monastery. Wikimedia Commons has media related to Galileo Galilei. ↑ "Galileo Galilei". starchild.gsfc.nasa.gov. Retrieved 2018-03-13. ↑ Sharratt, Michael 1994, Michael (1996). Galileo: decisive innovator. Cambridge University Press. pp. 1–2. ISBN 978-0-521-56671-1. ↑ Gamow, George 1988. One, two, three – infinity: facts and speculations of science. Courier Dover, N.Y.
↑ "Galileo". Biography. Retrieved 2018-03-13. ↑ Galilei, Galileo (1997). Galileo on the World Systems: A New Abridged Translation and Guide. University of California Press. p. 47. ISBN 978-0-520-91822-1. ↑ Hilliam, Rachel (2005). Galileo Galilei: Father of Modern Science. The Rosen Publishing Group. p. 96. ISBN 978-1-4042-0314-3. ↑ "Galileo's Discoveries - 400th anniversary". solar-center.stanford.edu. Retrieved 2018-03-13. ↑ "Galileo". Biography.com. Retrieved 2017-04-26. Drake, Stillman 2001. Galileo: a very short introduction. Brodrick, James S.J. (1965). Galileo: the man, his work, his misfortunes. London: Chapman.